How to Edit AD User Fields with ECP / OWA. Summary: How to create a management role with ECP / OWA. This system allows users with a tool and privileges to change AD Users' Identity, Title, Department, Company, and Manager Fields. Issue: Manager request to edit additional user fields from the OWA/ ECP site. Request includes Identity, Title, Department, Company, and Manager fields. Background: The manager is currently assigned to the Help Desk role group that allows basic address changes to staff contact information within AD; changes to additional fields are not permitted. Limitation: Exchange 2010 ECP provides built-in management roles. Editing extended role attributes are only possible with PowerShell. Create a new security group in AD (e.g. ECP_OWA-User_Fields). Group members will have permission to edit all users' organization fields. New-ManagementRole -name "Mail Recipients Extended" -Parent "Mail Recipients"
Get-managementRoleEntry "Mail Recipients\Get-*" | Add-ManagementRoleEntry -Role "Mail Recipients Extended"
Assign managers' user accounts to new security group membership in AD. Implementation allows managers (or help desk) to view and edit the organization fields for all AD users. Outlook Web App distribution group management is a handy tool built into Exchange 2010. The primary benefits allow end users to create and self manage distribution groups. This tool can also allow help desk access to the email server to assist end users. To enable the service, first log onto Outlook Web App, with the Administrator account. 1. 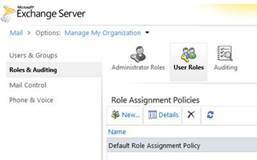 Enable “My Distribution Groups” for the default Role Assignment Policy. · This allows users to manage Groups from their Outlook Web App sessions. o Additional group owners may be assigned by current group owners. · Users may search public groups and request permission to join from the group owners. o Restrictions can be changed to allow auto join or leave. 3. When logged onto Outlook Web App as a user account (non-admin) Public Group options will be available. · Edit Public Groups owned by the user. · View groups user belongs to. Leave group. · Search groups. Request permission to join distribution groups. · Sue, Bob, Ned, or whomever can all manage groups with this tool.